Oklahoma: Reports of stripe rust were more common from Oklahoma this past week. Yesterday (25-Apr) I and Nathalia Grachet (OSU graduate student) looked at wheat in central Oklahoma to the southwest, west, and northwest of Oklahoma City (OKC). Wheat in this area was variable, but mostly around GS 10 (boot stage) to heads just emerging. Fields where freeze damage occurred showed a wide range of tiller maturity. Fields around Apache, OK (about 75 miles southwest of OKC) including the variety trial showed light powdery mildew and leaf spotting (tan spot/septoria/stagonospora) with stripe rust found in one field located about 10 miles west of Apache – not severe but the incidence was spread across the field (variety unknown). On our return trip to Stillwater, we found stripe rust on lower to mid leaves in the variety demo at Minco (about 25 miles southwest of OKC) with the most severe rust on Duster (photo below). Powdery mildew was severe on lower leaves of the wheat in the field surrounding the variety demo. No rust was observed at the variety trial at Kingfisher (about 30 miles northwest of OKC), and no leaf rust was found at any stop. Although not severe, stripe rust also was observed this past week around Stillwater/Perkins by Dr. Art Klatt (OSU wheat geneticist/breeder) and by Mark Gregory (OSU Southwest Extension Agronomist) in the variety trial near Chickasha (30 miles southwest of OKC). Dr. Klatt also reported severe powdery mildew in his plots near Perkins. Symptoms indicative of barley yellow dwarf are common around Stillwater and on the trip yesterday, however, freeze damage symptoms make it difficult to comfortably identify BYD without confirmation in the lab. 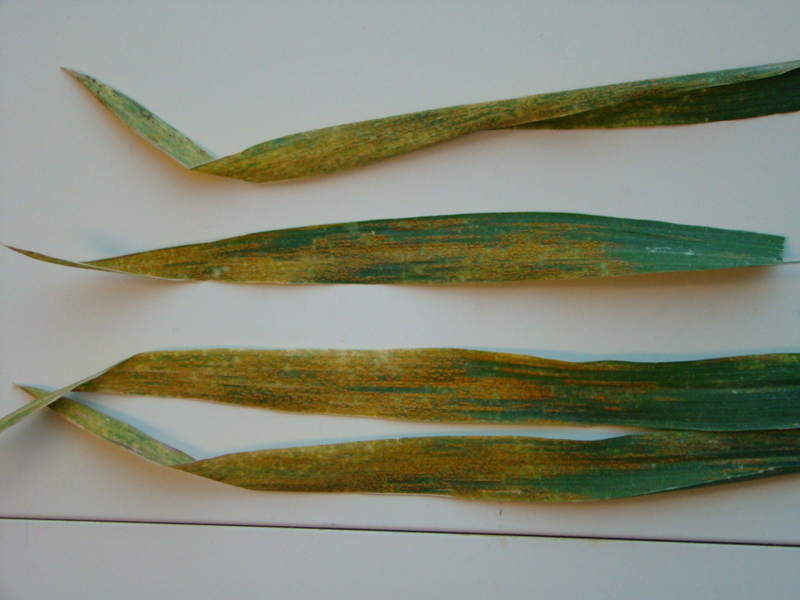 By osuwheat in Bob Hunger, disease, wheat on April 26, 2013 . I’d like to start fungicide program, but with freeze in 24th can’t know I have any heads to fill. Thanks for the update, but have to wait I have my own wheat, and consult on 5000+ acres–but can’t spend more money until we know on freeze. Freeze damage may be severe.